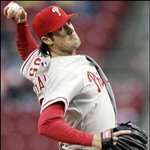 Colbert Michael Hamels was born on December 27, 1983 in San Diego, California. (Click here for a complete listing of today's sports birthdays.) The Hamels family actually lived in Rancho Bernardo, which is about 25 miles from downtown San Diego. Cole's parents, Amanda and Gary, instilled a sense of honor and decency in him. They told him to live his life trying to be the best person he could be and that he should treat people right. Cole’s goal since childhood has been to make his parents proud, both on the diamond and off. Cole was a big baseball fan as a kid. He learned a lot from watching Trevor Hoffman close games with his changeup for the San Diego Padres. He marveled at how even when hitters knew the pitch was coming, they seemed unable to touch it. Cole spent many an afternoon and evening at QualComm Stadium, rooting for Tony Gwynn, Gary Sheffield, Bip Roberts, and Fred McGriff. He was in the crowd when the Padres clinched the NL West title in 1998. In fact, he took it all in from the owner’s box! Despite his affinty for the Padres, Cole’s favorite big-league stars played in other cities. He loved Ken Griffey Jr., for example. Over the years, Cole assembled a nice collection of Junior’s baseball cards. And during backyard Wiffle Ball games, he had Junior’s swing down pat. No big leaguer had a bigger impact, however, than Tom Glavine. Cole followed the Atlanta Braves religiously on TBS. Glavine was his idol. Cole studied his every move, both on and off the mound. Although it eventually became clear that he would be taller and lankier than Glavine, Cole took the lessons he learned from Braves' broadcasts to heart. By the time Cole reached his teens, he was a hot commodity on the diamond. As a sophomore at Ranch Bernardo High School, he began to draw scouts like flies, thanks to his 94-mph fastball. Cole was hardly a well-kept secret. He pitched in a hotbed of baseball scouts, and it was not unusual for a dozen or more to be at RBHS games. The Broncos won division championships in 1999, 2000 and 2001. Cole broke his arm as a junior, causing a few teams—including the Padres—to lose interest in him. But he bounced back as a senior with an excellent senior season in 2002. Cole notched 10 victories, striking out 130 in 71 innings to go with a ridiculous 0.39 ERA. Unfortunately, the Broncos fell in the state playoff, losing to the Rancho Buena Vista Longhorns in the sectionals. That spring, Cole entered the draft as a surefire first-round pick. He went #17 to the Phillies, but negotiations dragged on longer than expected. By the time Cole signed, the '02 campaign was near its completion. He would be ready to start the 2003 campaign.